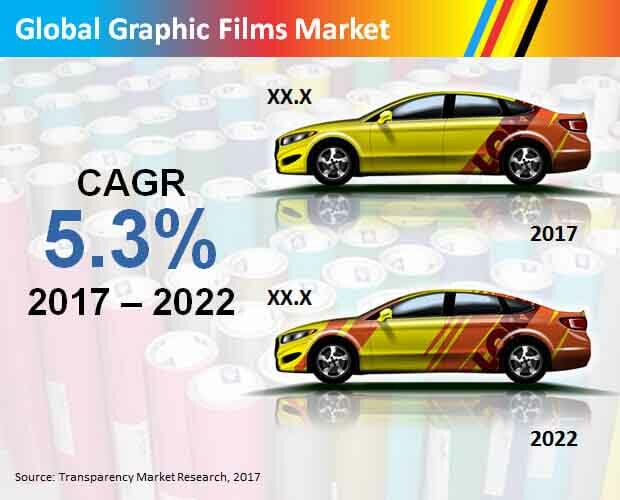 Most players operating in the global graphic films market are expected to grab lucrative opportunities in the near future, thus intensifying the competitive scenario, says Transparency Market Research, on the basis of a recently published report. Most players are attempting to develop new strategies such as improving product quality, reducing production costs, and increasing marketing reach. Leading companies existing in this market are Constantia Flexibles Group GmbH, Achilles Corporation, Arlon Graphics, Avery Dennison Corporation, Hexis S.A., Dunmore Corporation, 3M Company, Amcor Limited, and E. I. du Pont de Nemours and Company. The worldwide graphic films market is segmented on the basis of film type, material type, end use, and region. Under film type, the market consists of four prominent segments viz. translucent, transparent, opaque, reflective, and others. From these, transparent films have managed to garner a supreme share in terms of revenue owing to less cost and ease of usage. These films are expected to gain a valuation of US$10.4 bn by 2022, thus strengthening their lucrativeness in future as compared to other segments. Geography-wise, the global graphic films market is catalogued into Asia Pacific expect Japan, Europe, Japan, North America, Middle East and Africa, and Latin America. Owing to a strong manufacturing infrastructure and availability of manpower in Asia Pacific, this region has grabbed the titular spot in terms of regional analysis, thus attracting handsome revenue share. The global graphic films market is prognosticated to gain a revenue of US$33.7 bn by 2022, which is a significant rise from a base valuation of US$26.0 bn recorded in 2017. This surge in valuation is expected to occur at a healthy CAGR of 5.3% during the forecast period from 2017 - 2022. Vehicle protection from intense sunlight exposure is highly necessary in order to reduce fuel wastage. This protection is possible by using graphic films in the form of coatings applied on the vehicular chassis surface. The need for such protection is a crucial driving factor for the global graphic films market. The international graphic films market is also expected to witness tremendous growth on the back of an expanding vendor landscape in emerging economies such as India and China from the Asia Pacific region. A spurt in tourism as well as product marketing is occurring in almost every region of the world, wherein a great need of graphic films for advertising purposes exists, thus pushing the market. Customers prefer using graphic films as compared to their substitutes due to their lightweight nature and less cost, thus drawing in a higher demand through its market. A noticeable trend being observed recently involves using pressure sensitive graphic films in applications such as road safety, traffic markings, and architecture, consequently bolstering the market. However, sluggish growth observed in Middle East and Africa and Japan regions could be a major hindrance affecting the overall performance of the global graphic films market. Volatility in raw material prices and haywire market structure are a couple of other restraining factors negatively influencing the global graphic films market. However, rapid innovations carried out by various raw film manufacturing companies are expected to negate such effects caused by the market’s restraints. The information presented here is based on the findings of a report by Transparency Market Research, titled, “Graphic Films Market (Film - Opaque, Transparent, Translucent, and Reflective; Material - Polyvinylchloride (PVC), Polypropylene (PP), and Polyethylene (PE); End Use - Automotive, Promotion, Advertising, and Branding, and Industrial) - Global Industry Analysis, Size, Share, Growth, Trends and Forecast 2017 - 2022”. A noticeable trend being observed recently involves using pressure sensitive graphic films in applications such as road safety, traffic markings, and architecture, consequently bolstering the market. Owing to a strong manufacturing infrastructure and availability of manpower in Asia Pacific, this region has grabbed the titular spot in terms of regional analysis, thus attracting handsome revenue share.